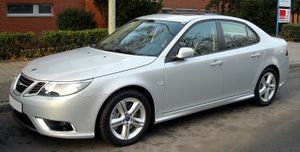 The second-generation SAAB 9-3 was launched in January 2002, at the North American International Auto Show for MY2003. 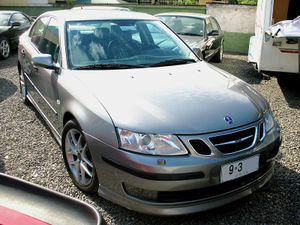 The second generation 9-3 was based upon the GM Epsilon platform which it shared with both the Cadillac BLS and Opel Vectra. The 9-3 was available in SportSedan, Convertible and SportCombi (Wagon) and was produced from 2003 through to 2014. Tie-downs for net in trunk gone. Passenger floor mat holders gone. Headlamp washers...pop-up style replaced by permanently raised washers. Locking mechanism for gas cap gone. Dead pedal in carpet gone (only a limited run at very beginning of 03). Carpet changed from a berber-type. Upshift light for manual trannies gone. Some unspecified change that resulted in becoming the first car ever to be called the IIHS "Double Best Pick". Colors Midnight Blue, Dolphin Grey, Cosmic Blue gone. Colors Nocturne Blue, Espresso Black, Glacier Blue, Hazelnut , and Lime Yellow (convertable only) added. Rear Passenger vents in Linear centre console gone. Interior Motion Detection gone, removed halfway through MY2004. CRAS indicators go from sewn in to heat-staked. Dash indicator lights different & move around for 2005. Speed dependant Volume (SDV) actually works. Aux-in standard on all models except Linears. No Manual 6-speed, only 5 speed (USA only). Navigation added for the US market. Driver's side door trunk release...no longer illuminated. Storage console in rear centre armrest gone. Moonroof has plastic trim around it instead of black flocking. 'SAAB' embroidered logo on front floor mats gone. Passenger floor mat holders returned. Parchment floor carpet changed so all models have Grey carpet. Colors Espresso Black, Graphite Green, Merlot Red, Hazelnut, Glacier Blue gone. Colors Chili Red, Parchment Silver & Smoke Beige added. Bosch engine management for 2.8T. Stitching on leather shift knob is different. Phone button is now spelled out PHONE instead of the handset picture. Plastic moulding around sunroof is different. Aero steering wheel has silver thumb inserts. There is a airbag off indicator on the right side of the instrument panel. Electric Blue Metallic paint, Electric Blue tonneau cover, Electric Blue interior door trims. Parchment coloured leather sports interior with matching Electric Blue trim lines in the centre. 13 speaker audio changed to 10 speaker audio. Aero automatic transmission now 6-speed instead of 5-speed. 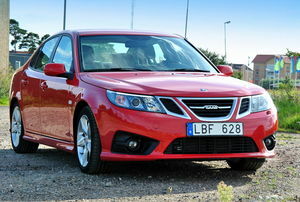 Linear model and 2.0t (175 HP) engine no longer available in North America. Garrett turbo previously used in 1.8t and 2.0t from 2003-2005 is no longer used for these engines. All turbos for 4 cylinder engines now sourced from Mitsubishi. Colors Jet Black, Fusion Blue, Arbor Green & Electric Blue (20th anniversary convertible only) added. Colors Arbor Green & Sapphire Blue gone. Black leather now optional on all models. 5-speed manual dropped on 2.0T, 6-speed manual and 5-speed automatic only for 2.0T. Aero transmission choices identical to 2006/2007. XWD now available on 2.0T. Now standard with Aero trim package. Not available on convertible. Colors Carbon Gray & Glass Gray added. Revised front bumper with new fog lights. Headlights are now blue tinted. 'SAAB' used in place of griffin badge on boot/tailgate handle. New dashboard trim with the option of Titan Silver or Cubic. New alloys, ALU 88 and ALU 90. All badges replaced with new style "SAAB" badges. New seats with one pice anti-whiplash head restraint. Only available in Aero trim level. Only avaliable in silver or black. This is the base sound system and has four speakers. There are 2 speakers in the outer edges of the dashboard and 2 in the outer edges of the parcel shelf. The system is only powered by EHU (Entertainment Head Unit). This system includes the 4 speakers above plus 2 speakers in the front doors and a centre speaker in the dashboard. This setup also includes AMP 1 which is located under the front passenger seat. This system includes the 7 speakers above plus 4 speakers all in the back parcel shelf (2 treble & 2 bass), and 2 more treble speakers in the dashboard. This setup includes AMP 1 and also AMP 2 which is located in the left side of the boot. ES1 (ICM1) is the base model with no screen, just buttons. Spartan, efficient, clean. ES2 (ICM2) is the mid model and has a monochrome green screen, and a telephone keypad. ES3 (ICM3) is the top level and has a wide-screen colour display. ES4 is the same as ES3, except it includes Automatic Voice Recognition software. Tel2, Integrated telephone system with dedicated sim card. This page was last modified on 9 November 2015, at 19:58.